Re:released due to popular demand. 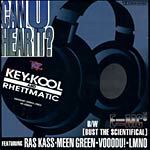 Now is your chance to own the first Kozmonautz (Key Kool & Rhettmatic) single. B-side features Ras Kass, Meen Green, Vooodu!, and LMNO!